Create Your Plate: An Easy Way to Eat Well is a brochure featuring a two-page layout of the plate method for diabetes meal planning. This is a great resource for newly diagnosed patients or those needing a simple meal planning technique. It can be a real challenge to maintain proper portion control whether you’re at home or on the go. 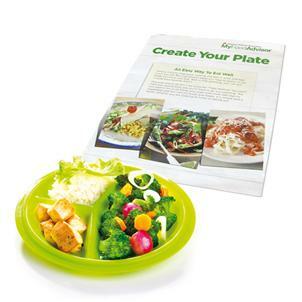 For this reason, we included the Precise Portions 9” Go Healthy Travel Plate with Lid. Now, whether you’re at home or at the office, you can manage your portion sizes using this three-sectioned to-go plate featuring an easy-sealing lid with ventilation control for microwaving. Plate and Lid are BPA-free, dishwasher-safe, and microwave-safe. This makes things visually easy to prepare a meal by a serving. I've seen many ways to visualize a serving ( the hand, fist, measuring cups, etc. But this plate makes preparing my plate in the future at a party, restaurant or at the park easy to visualize to keep with in my portion of a serving. Great!.